The Sony Xperia M is equipped with a 5 megapixel camera that can produce still shots with a maximum resolution of 2592 x 1944 pixels. The camera interface consists of two panes and is unified with the camcorder one - you can start snapping away or shoot a video without the need to change modes. The right one holds four virtual buttons - a shortcut to the gallery, video and still shot shutter keys, and a primary/secondary camera toggle. On the left you get the shooting mode selection key in the top corner, followed by three customizable shortcuts. The final shortcut here opens the drawer with all available settings for the given shooting mode. Naturally, the Sony Xperia M camera offers all kinds of features, including HDR mode, Sweep panorama face detection, geo-tagging and touch capture. Scenes and picture effects are available too. The effects split the screen into nine segments and show a live preview of each of the nine effects, but it's a little laggy. The camera has an auto upload option, but that only works with Sony's own PlayMemories Online service. You can set it to upload only over Wi-Fi and only while charging. The image quality of the Sony Xperia M photos is not that good. The dynamic range is low and the photos often have their highlights blown out even when the image appears underexposed. Colors are not great either with white balance visibly off most of the time - and it's not consistent, we saw blue tint, yellow tint even green tint. There is a lens issue with our unit too, with visible corner softness on the left. All that said, the amount of fine detail looks okay for a 5MP camera, but the overall results are not great. HDR mode is available too, helping you bring extra dynamic range to both the shadows and highlight areas of your shot. It messes up the colors further and reduces the contrast noticeably. The Sony Xperia M goes into our photo compare tool in the lightweight category of 5MP. You can check out how it's bigger sibling, the Xperia L, did along with other phones in the same market segment. The Sony Xperia M is capable of capturing 720p video footage at 30fps, same as the 8MP camera of the Xperia L. However, there's no HDR mode for the video. What came as a disappointment for us is the fact that even though the Xperia M is able to capture still shots while recording video, it only produces images at VGA resolution - which is a third of the resolution of the video, making it quite pointless. More crucially though, Sony Xperia M just doesn't record good video (the L didn't either). The clips shot with it look like upsized VGA footage as they lack detail and look all pixelated with heavy oversharpening halos. Colors are okay and framerate is steady at 30fps, but the lack of detail really ruins the whole experience. The continuous autofocus feature triggered too often too. Strangely enough videos have more than enough bitrate at about 17Mbps mark (the L did 12Mbps! ), so you can't really blame it on compression. The whole thing is a waste of storage though, 17Mbps could fit 1080p video, let alone that the quality suggest something closer to 5Mbps. Other than that the video sound is recorded in stereo at a 96Kbps bitrate, which is just enough. 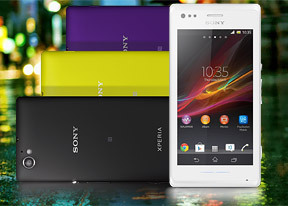 Good or not, the Sony Xperia M enters our video comparison tool database. See how it does against entry-level Androids and Windows Phone handsets (which typically beat their Android rivals in terms of chipset and camera).